CLASS FEE $50 per session or FREE if you purchased your machine from us. Session I: The Operation of Your Embroidery Machine When you purchase your machine we will schedule a private session with you to teach you how to operate your embroidery machine. Session II: The Basics This class will be a lecture/demo about the basic supplies used for successful embroidery. We will include the selection of needles, threads, stabilizers and specialty notions designed to help you get started. Session III: Successful Hooping and Design Placement. Professional embroidery requires a knowledge of how to hoop and proper placement of your design. 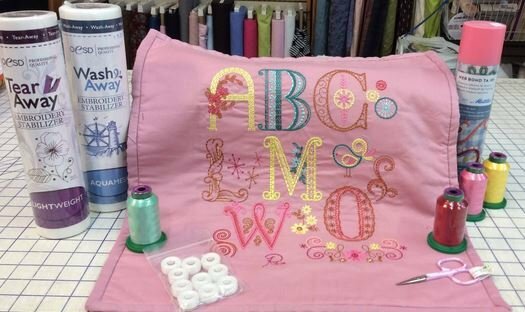 Session 1 Call to schedule private session on your machine; Session 2 Lecture/Demo; Session 3 Bring your machine, basic embroidery supplies and an article or fabric to embroider on.